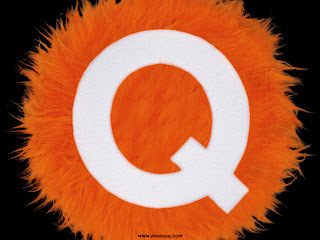 We went to see Avenue Q last night at the Palace Theater in Cleveland. It is a Broadway musical that is a sort of Sesame Street but with more adult themes, such as racism, homosexuality, and dealing with bad turns. It won the 2004 Tony award for Best New Musical. This is absolutely the funniest show I have ever seen. The songs are very funny and often satiric and the dialogue is full of jok es. All but three of the characters are puppets, and the puppeteers are right on stage with their characters. It is interesting watching them act through their emotions while also projecting those same emotions through their puppets. You find yourself switching your gaze between the puppet and the puppeteer, but it is done so well that you really do believe the puppets as characters. 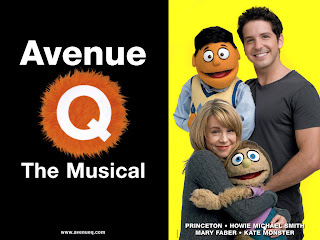 Several of the characters are loosely based on Sesame Street characters (though there is no affiliation between this show and the real Sesame Street). There are Rod and Nicky, who are modeled after Bert and Ernie, but Rod is a closeted homosexual who secretly has a crush on Nicky. Rod does come out by the end of the show and Nicky finds him a boyfriend, Ricky (who happens to look amazingly like Nicky). There is Trekkie Monster modeled after Cookie Monster. And there is the requisite cast of diverse humans...Brian, a Jew; Christmas Eve, Brian's Japanese wife; and Gary Coleman (played by a woman), who is an apartment superintedent on Avenue Q. The main action revolves around Princeton and Kate Monster (yes, monster's are a race in the puppet world). Princeton has just graduated from college with a B.A. in English but feels his degeree is useless. He spends most of the show looking for his purpose (which he ultimately discovers is to make a Broadway show about what he's learned about life after college). Kate Monster is a kindergarten assistant who dreams of opening a school for monsters. Everything works out in the end, and we learn that everything in our lives, the good and the bad, is only for now. Bad times will get better; good times may get worse. But that is life. We saw this in New York last March, I must say that the New York cast we saw was much better, but the performers last night were all very good. The next show we're going to is Wicked, the story of the witches of the Wizard of Oz. 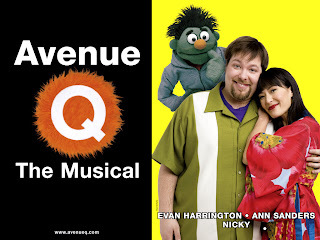 Wicked was expected to beat Avenue Q for Best New Musical in 2004, but lost in a bit of controversy. We've seen Wicked twice and I'm looking forward to seeing it again. Both of these shows are towards the top of my list of favorites.